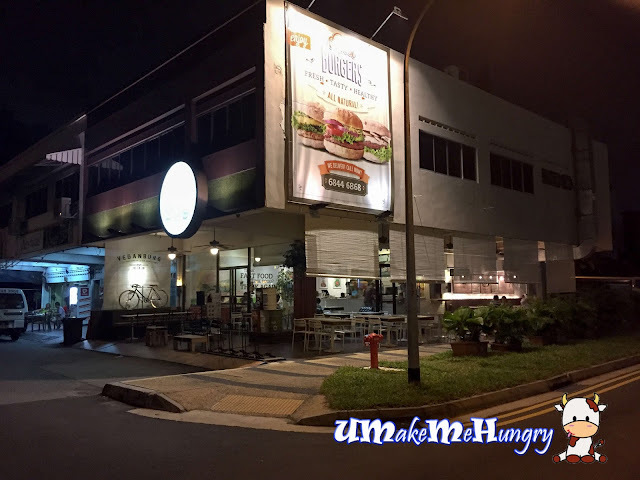 A night in the East side of Singapore had given us a chance to visit Vegan Burg in Jalan Eunos. With founders believing that plant-based diet is environmentally sustainable, they try to inspire and influence the world around with vegan diet into their lifestyle. I particularly like the benches they had as it was decorated with faux grass patches. 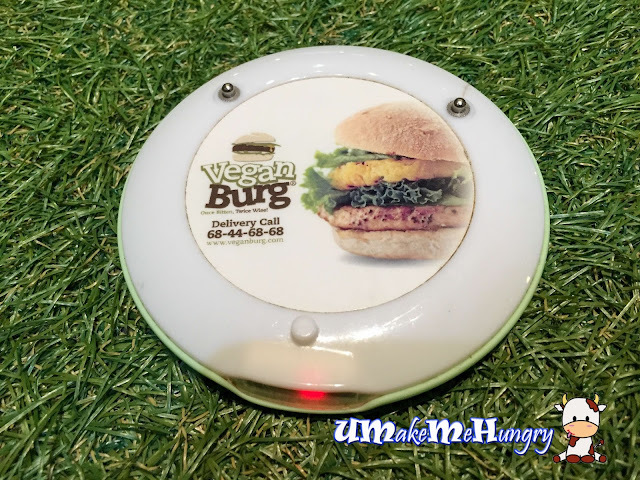 It really matches the theme of eating greens and ambiance created in Vegan Burg was like dining in the garden, a special kind of feeling like having a picnic. 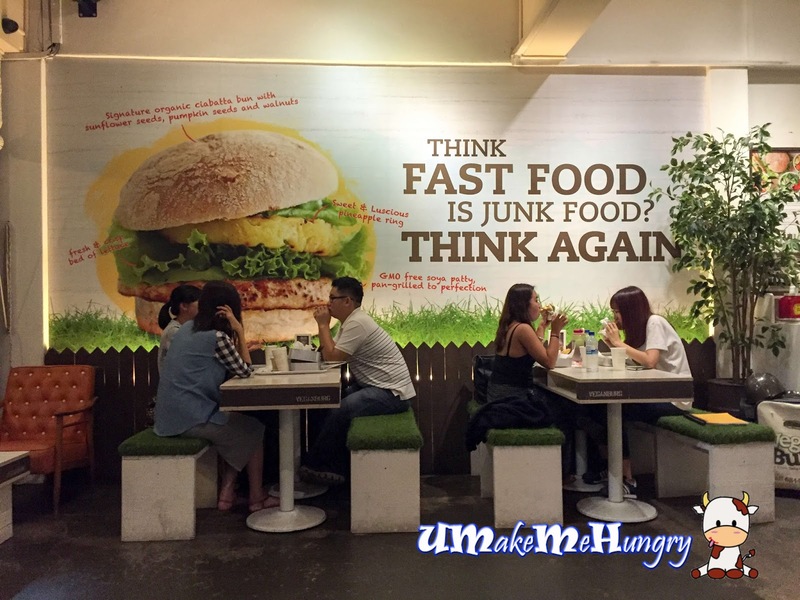 The Advertisement splash on their wall had given another view towards having burger. If you think that having Fast Food is consider as junk food, perhaps you have to head down here and understand more about their burgers. Think Fast Food Is Junk Food? Think Again. Self service is observed in the restaurant and with the help of the buzzer system. Besides dining in Vegan Burg also offer services right to your doorsteps, in case you are craving for Fast Food and do not want to feel so sinful, this is another option for you. 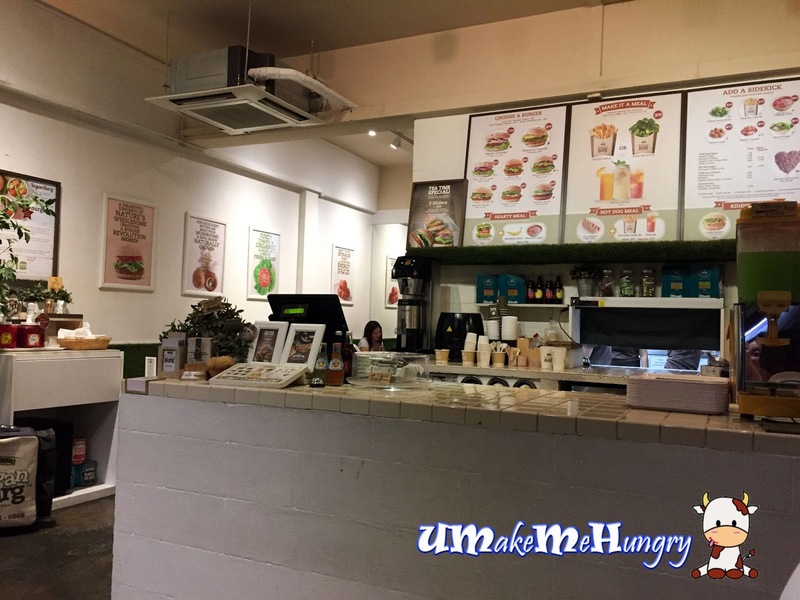 There are 3 kinds of chiller available to choose from if you are having a set meal. 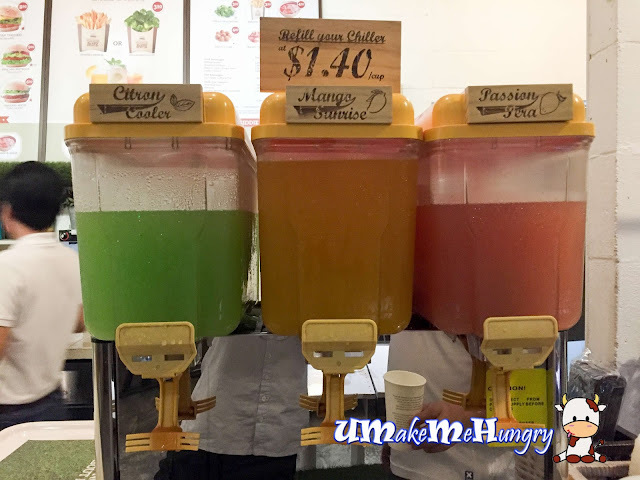 They comes in three different color where by the green represents the Citrus cooler, the orange represents the mango sunrise and pink represents the passion fruit drink. However, there are no free flow of the chiller but you have to pay $1.40 per cup if you want it to be refilled. Interestingly, I would never have thought that my burger would be served in a mass tin with grease paper. Burgers and the choice of side was served in it. 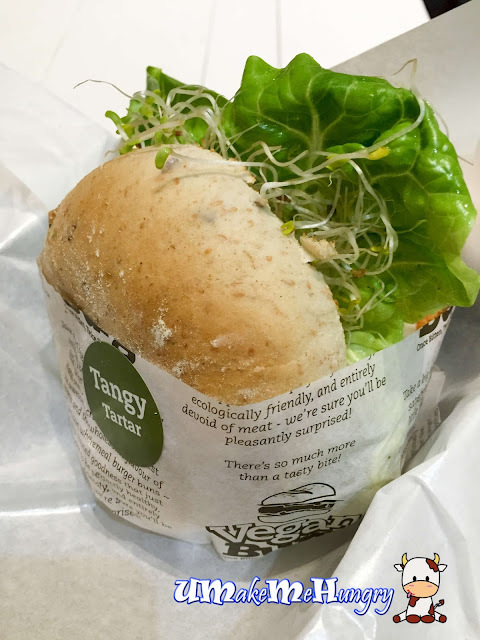 A good thing about the burger was that it was half wrapped and enable patrons to grab from the mass tin immediately and pop it into the mouth conveniently. Assorted vegetables were included in this vegan meal. For those who are not taking onions, their friendly service will ask if you want them before the burger preparation. Seaweed fries on the other hand were special, they were fat and yummy. Though they were not that crispy like the common fast food joint, you can really taste the authentic use of potatoes in it. Tangy Tartar were half wrapped and standing vertically on the mass tin. 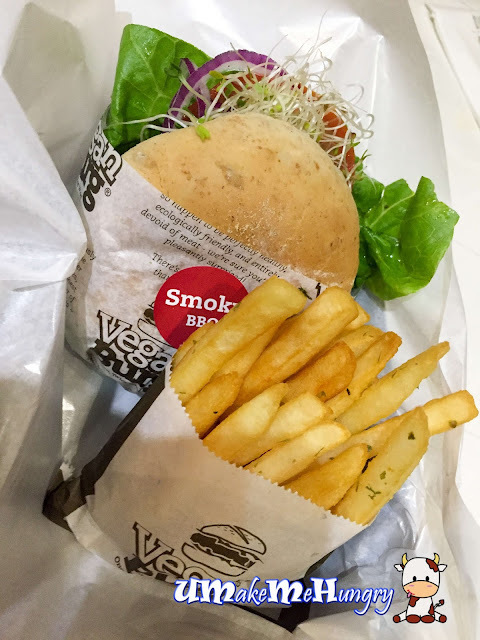 Just like the Smoky BBQ burger, the buns came along with whole meal grains which is healthy. The regular shape patty had signs of dryness. 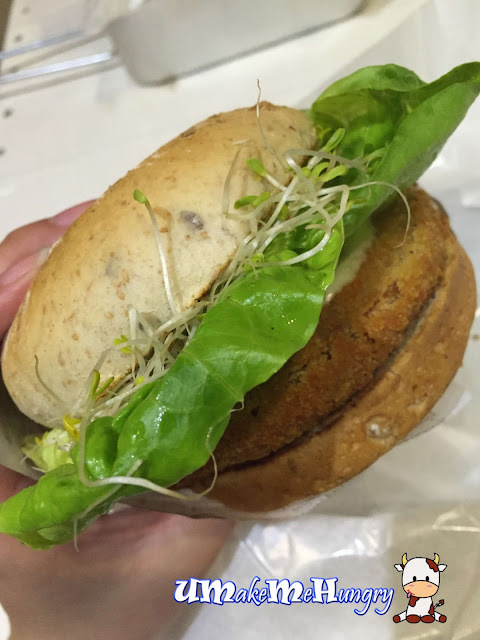 From a non-vegetarian point of view, the burger with was pretty good even without the use of meat. Topping up my meal with their Granny's Soup. 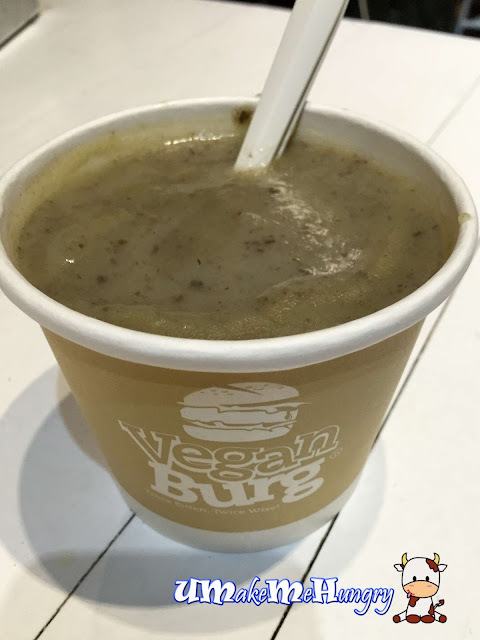 I was in luck during that day of visit as they purposely prepare this cup for me as their last batch of soup had sold out. The soup's texture was more like a paste but it was fragrant infused with herbs. Flavours of mushroom were adequate, a concentrate soup more than I have expected. Overall, it is a good experience having the so called "fast/junk" food turning into a healthy diet.